Simply put, Super Teacher Worksheets is one the best and most affordable educational resources for teachers. This is a must have for any K-5 educator looking for worksheets, printables, flashcards, and more. Also, there are 1000's of printables/worksheets on a wide range of subjects such as: Math, Science, Reading, etc, that are aligned to Common Core Standards. STW even has worksheet generators for puzzles, crosswords, etc, as resources for different holidays and events. 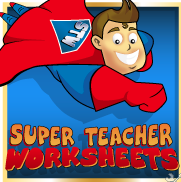 I highly recommend checking out Super Teacher Worksheets by clicking here!!! Looking for free Smart Board lessons check out Modern Chalkboard.